View more information about nearby Native American nations or Arizona Top 40 Things To Do. Admission – General Admission $19.50 (18-24), seniors $17.50 (64+). Biosphere 2 ­- To serve as a center for research, outreach, teaching and life-long learning about Earth, its living systems, and its place in the universe. Old Tucson Studios – Experience the Old West!! Kartchner Caverns State Park – Is a large “live” care with stunning limestone walls, along with unique minerals and formations. > Big Room Tours are not available for children under 7 years of age. San Xavier Mission – Full Functioning church with regular mass, Along with a museum at the Mission that explains more about our history with artifacts. Titan Missile Silo - The Titan Missile Museum is the only remaining Titan II site open to the public, allowing you to relive a time when the threat of nuclear war between the U.S. and the former Soviet Union was a reality. Patagonia-Sonoita Creek Preserve – One of a few remaining permanent streams, it provides for a wide array of diverse species from endangered fishes to butterflies and birds. Willcox Wine Tasting and Touring – Savor the variety of Willcox wines when you visit the tasting rooms and vineyards. Children’s Museum Tucson – A fun, play-based, interactive, hands-on learning experiences for children and their families. Sabino Canyon Trails - Sabino Canyon is a natural desert oasis located in Tucson’s Coronado National Forest and is home to spectacular desert landscapes and abundant wildlife. Tucson Botanical Gardens - The Tucson Botanical Gardens promotes responsible and appropriate use of plants and water in a desert environment through education and demonstration and provides a place of beauty and tranquility for Tucson residents and visitors. ~ Children 3 and under and Members are always free! Degrazia Gallery In the Sun - Experience the gallery through a scheduled tour of the 10-acre foothills site and explore the art and architecture of Ted DeGrazia, including the original home of the prolific artist and his wife Marion, their burial sites, the adobe Mission in the Sun, Gallery in the Sun and the cactus corral. Southern Arizona Transportation Museum – This non-profit museum is dedicated to preserving Rail History in Southern Arizona., the historic depot and locomotive # 1673. 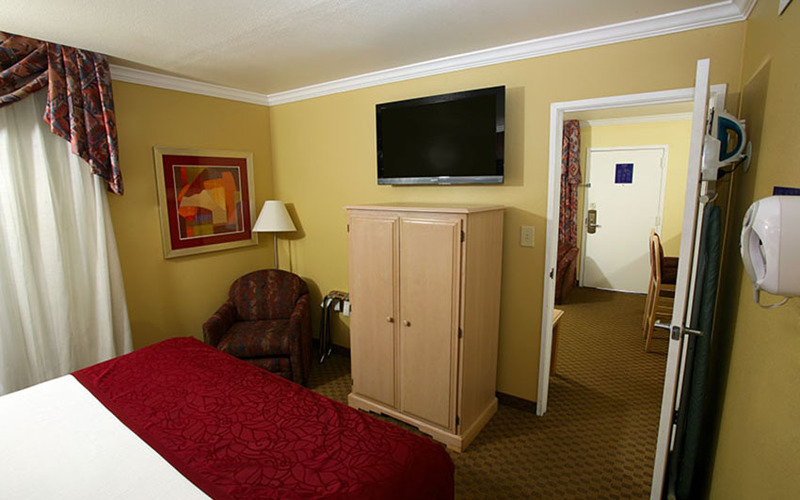 BEST WESTERN InnSuites is the perfect gateway to the exciting array of attractions and activities in the Tucson/Oro Valley/Catalina Foothills area. Enjoy museums, a game of golf or watching an Arizona Wildcats game. 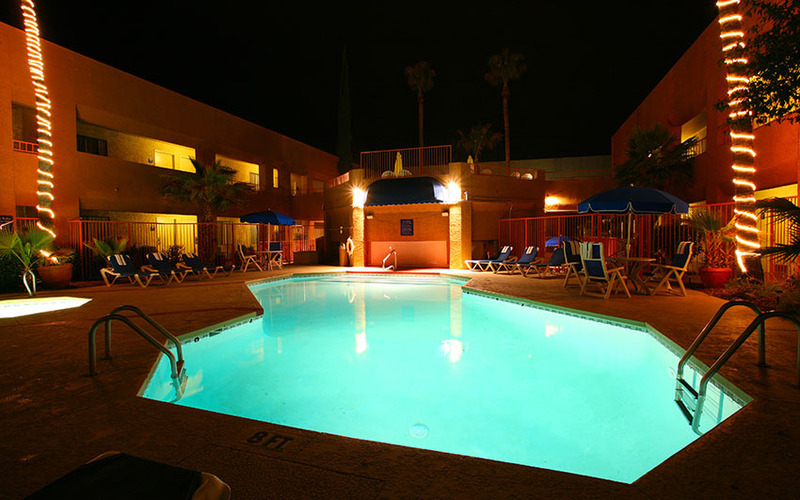 Enjoy quick access to University of Arizona, nearly every museum, Tucson business, shopping venue, and park imaginable. Allow the front desk to arrange a day of desert exploration, horseback riding or golf game. Built in the late 18th Century, San Xavier has been described as the Sistine Chapel of the United States because of the beautiful Spanish Colonial architecture and colorful art. Mission San Xavier “White Dove of the Desert” is located on the Tohono O’odham Indian Reservation. For a half-century the Arizona-Sonora Desert Museum has enchanted millions of visitors with its exhibits of live animals in astonishingly natural settings, while intriguing and instructing them with fascinating educational programs. More than something to see…. it’s something to do! Come to the Museum and experience a fun way of learning! All the exhibits are hands-on, encouraging interaction and triggering each child’s intellect. The mission is to preserve and present the history of flight in such a way that the museum visitors experience a very large collection of aircraft, missiles and related artifacts in a rather extensive archive and library. The Fort Lowell Museum is located in the reconstructed Commanding Officer’s quarters of Old Fort Lowell, originally established in 1873. The museum features exhibits about military life on the Arizona frontier. Walking tours, lectures, living history events are featured as special events. Featuring over 400 species of worldwide mammals, birds and insects. Some collections are over 100 years old! Come visit the Tucson zoo, and have a wild time. Meet the more than 400 animals—rhinos, elephants, anteaters, polar bears, lions, and many more! Adventure in our African, Asian, and South American regions. Explore the Flight Connection, our full-flight walk through aviary. Go behind the scenes and discover the inner workings of the zoo. This beautiful oasis in the heart of Tucson was originally the home of Bernice and Rutger Porter. Dating to the 1920s, the earliest buildings on the property were constructed of adobe bricks made right on site. Tucson Botanical Gardens is a place of beauty, inspiration and education about the natural world. Find your lucky streak in one of the Tucson’s Casinos ! The floor is full with over 400 of your favorite games — from Little Green Men and Wheel Of Fortune to the classics like Sizzling 7’s and Double Wild Cherry. They have you covered with everything from nickel and quarter to dollar and multi-denominational machines. Southern Arizona’s premier entertainment destination also hosts top national acts performing live at the 2,400-seat Diamond Center. The casino’s Sports Bar also offers live local entertainment. Arizona Opera currently produces a five opera season, with three performance dates in Tucson at the TCC Music Hall and four performances at Symphony Hall in Phoenix. The Tucson Symphony Orchestra is the oldest continuing professional performing arts organization in the state of Arizona. Borderlands Theater is a professional theater company recognized nationally and internationally for the development and production of theater and educational program. Located between the Tucson Museum of Art and the University of Arizona Museum of Art. Our 5,400 square foot historic warehouse space hosts new exhibits every 6 wks. The 6,000 square-foot gallery in ‘Gallery Row at El Cortijo’ in Tucson offers a diverse collection of subjects and styles. If you thought Tucson was surrounded by flat, sandy desert, you are in for a surprise. Arizona’s landscape is varied and beautiful, and you can see a lot of it in a series of day trips out of Tucson. Visiting The Grand Canyon from Tucson. If you are visiting Arizona, it is well worth the drive to visit The Grand Canyon. 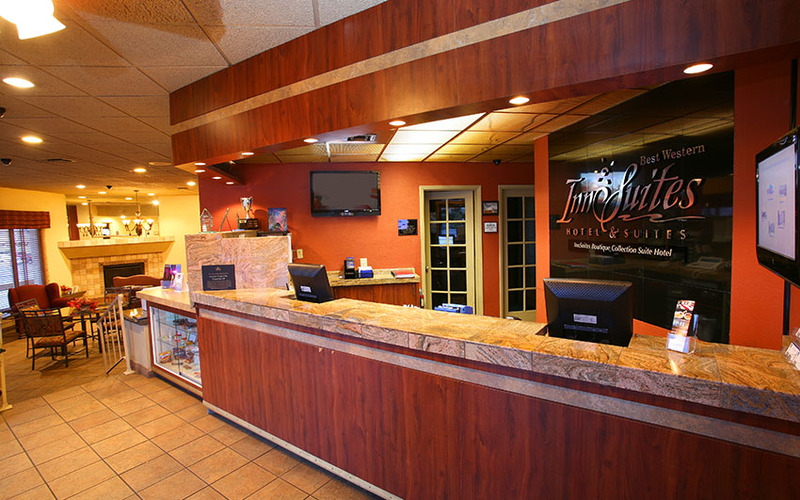 BEST WESTERN InnSuites Tucson Hotel & Suites is a perfect gateway to visiting Sedona, Arizona. Approximately 3 hours from Tucson lies the town of Sedona–located in north central Arizona. 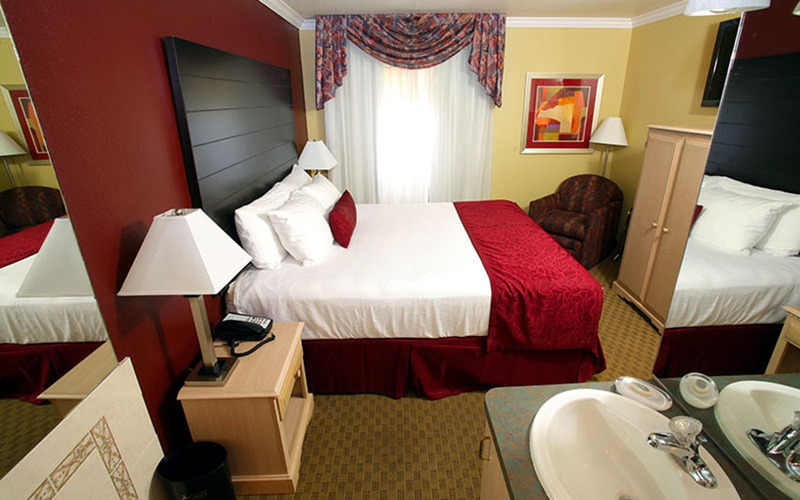 BEST WESTERN InnSuites Tucson Hotel & Suites is a perfect gateway to Southern Arizona. Southern Arizona offers many fun and exciting places to visit including Tombstone, Tubac and Mexico. Driving about one hour southeast of Tucson is Tombstone, Arizona. “The Town Too Tough to Die” has a vast array of attractions and points of interest for all ages. There are many places to eat, drink, and sleep in town, as well. Before crossing the border give the U.S. Customs office a call to check for current regulations. The Mexican and U.S. Customs offices are available 24 hours a day to answer any questions (520) 287-1410. You may also call (520) 885-0694 for more information. 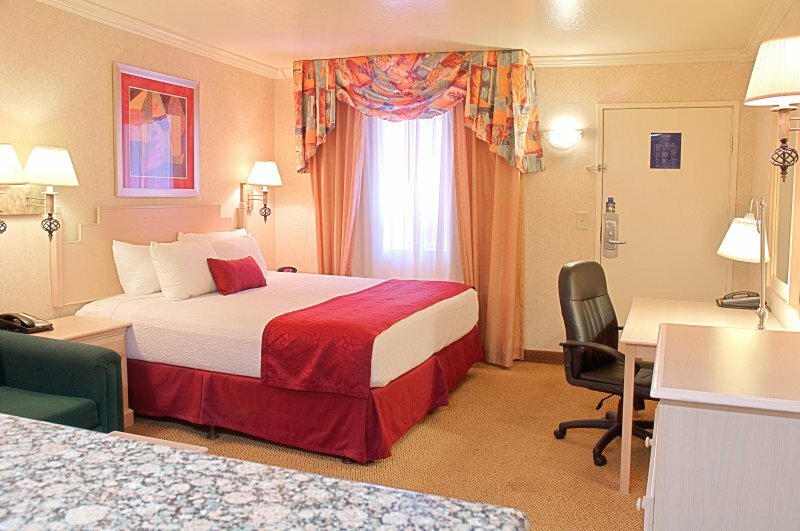 Hotel Tucson City Center Conference Suite Resort is home to the Tucson Gem and Mineral Show! The “Gem Show” is much more than a single event at one location. Rather, there are thousands of participants and attendees at more than 40 sites around town. Dozens of shows take place at the same time – in giant white tents, at hotels and resorts and at exhibit halls. 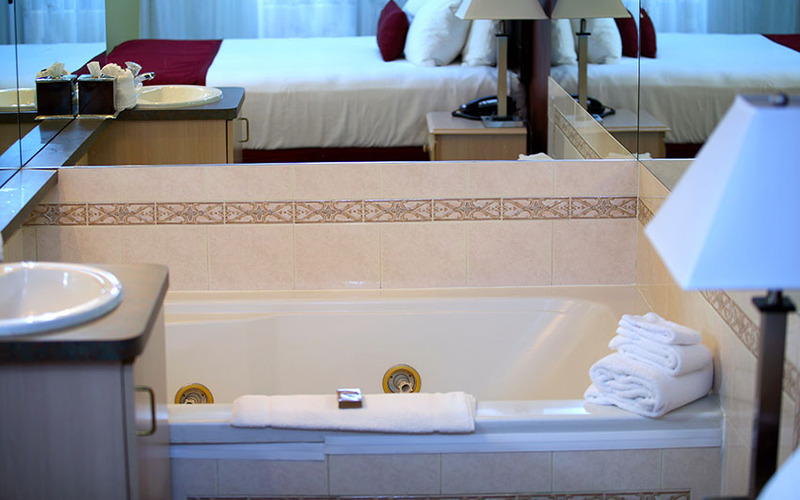 The largest show is at Hotel Tucson City Center at 475 North Granada Avenue in Tucson, Arizona. This show attracts thousands of treasure hunters from every corner of the globe and is open to the public. There are displays from renowned museums and private collections along with over 250 mineral, gemstone, jewelry and fossil retail dealers. It also features hands-on exhibits only for school children. Most of the gem and mineral shows around Tucson are free and hours vary.